Great skirts require great fabric. The fabric we can get our hands on for far less than an arm and a leg these days is nothing short of amazing to me. Including the fabric I find at Fabricworm. One of the reasons I stopped sewing in college was that I couldn’t find fabric I liked. I lived in a small college town and crafty blogs didn’t exist yet. I made a few things here and there with chain store fabric, but I didn’t looooove it. It was more of a make-do. Okay, also, there were classes. And boys. And part-time jobs. So it wasn’t like I was sitting around being mad about it, it’s just that there wasn’t much inspiring to be had and I had plenty of other things to focus on. 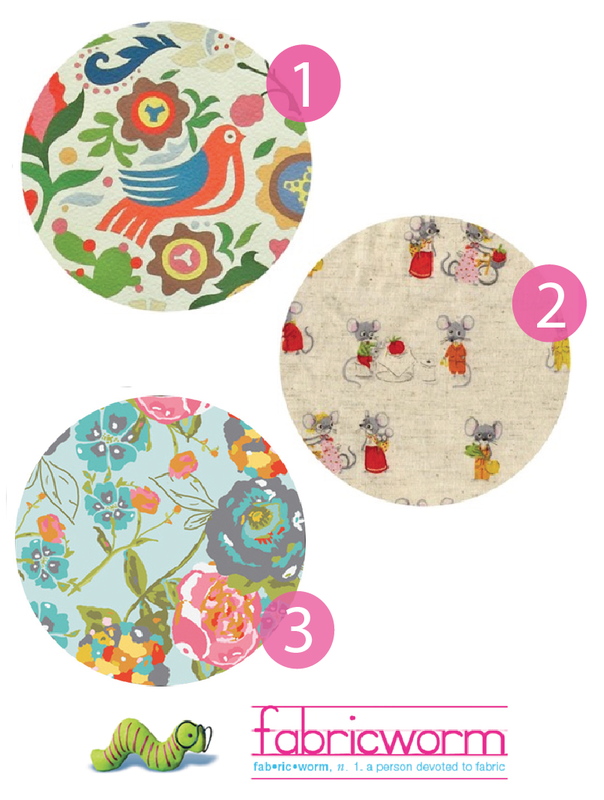 When I really started sewing again with Adrianna, Fabricworm was one of the first shops she pointed me to. And I have a clear memory of opening my first carefully wrapped stack of fabric. Heavenly. It’s so exciting to make your choices on the screen and then see that package arrive. We were overseas together at the time, so the extra travel time involved made any and every package seem all the more important. (While the delay made it more “special” I wouldn’t trade it for the fast shipping/nearly instant gratification of living stateside.) I was in love with the quality of the fabric and the total beauty of the prints. And dang, that’s the cutest worm ever, ain’t it? None of this amazingness is to be found at a chain store. If you’re looking to roll around in fabric options, this is a fun place to do it. These are my current favorites– the first being available right. this. second. and the next two coming later this month. 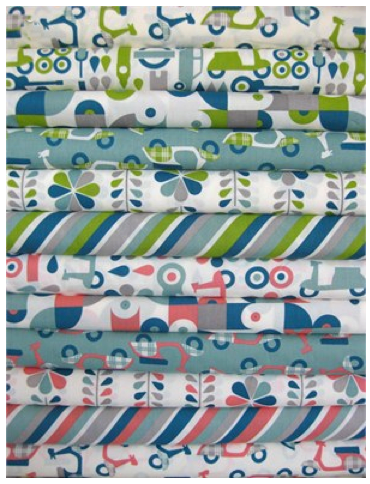 Fabricworm is giving four of our eight Skirt Week winners any two yards of Mod Squad by Dan Stiles for Birch Fabrics Organics. Sweet! A number of prints in this collection would make fantastic coordinates for the I Spy projects that I go crazy for, but those cameras in this custom bundle! So so so cute! If you’re not connected to one of the 365 entries this year, hop on over to the flickr pools and start placing your bets. (365! Clearly there’s one person out there who missed the deadline– it’s leap year!) The judges are rolling on their picks! P.S. Unrelatedly, Adrianna will be landing in America this afternoon! There are endless questions from K about when they’ll be here– which is not for another two weeks. This is unacceptable as far as K is concerned. I, on the other hand, am plotting just how we’ll fit all there is to do into the time we’ll have to hang out! I can never get enough of Fabricworm!